My challenge for those who read my journal entry: Identify a blessing in your life and challenge a friend or two to do the same. Let’s create a “Pass our blessings forward” chain! Jabez called on God of Israel saying, “Oh that you would bless me indeed, and enlarge my territory, that your hand would be with me, and that you would keep me from evil, that I may not cause pain!” So God granted him what he requested. Some years ago I was introduced me to a little book by Bruce Wilkinson, “The Prayer of Jabez”. I preached this prayer several times in my ministry. I shared this book with people I encountered as a pastor. Today, in my devotions, I took time to re-read this book and some of my past sermons in preparing to write in this blog. This book has again brought me strength and encouragement in facing recent health challenges. The books of Chronicles, found in the Old Testament, lists chronologies of those who have been faithful descendants of Judah – so there are dozens of names. Perhaps this is the reason I have avoided reading / studying this particular scripture! The one name that stands out above all others: Jabez. There is little we know about this man. 1. “Oh, that you would bless me indeed”. It’s OKAY to ask for God’s blessings! The neat thing about blessings is they are transferable. You can call upon God for personal blessings and then transfer those blessings to others – and ask for these blessings to be shared with others. “Pay–it–Forward” comes to mind. As a reflection of this biblical concept of “blessings” we turn to Genesis 12:2 and the words to Abram who says, “I will make you a great nation, and I will bless you … so that you will be a blessing to others.” Honestly, it is hard to think about personal blessings without also contemplating how to pass these gifts, these offerings – these blessings on to others. 2. “and enlarge my territory…” is allowing us to live larger than ourselves. This prayer calls us to enlarge our personal borders, our coast, the perception of tasks – even risks we are willing to take knowing that God is always going to have our back. I will have more to say about this theme in just a few moments. 3. “that your hand would be with me…” The “hand” of God speaks to me of the power of God….asking God not only to bless but also empower – in sharing our lives (and blessings) with others. As Christians where do we get our strength, our motivation, our power? Jesus Christ our Lord is our strength and salvation – or as Psalm 18 says, “The Lord is my rock, my fortress, and my deliverer, my God, my rock in whom I take refuge.” God’s hand, God’s power surrounds and empowers us! 4. “and that you would keep me from evil….” There are lots of things that tempt us in life that threaten to our getting off track in doing God’s will. What are the things of this world that keep us from realizing our full spiritual potential? What separates us from God? Just as we pray, “deliver us from evil….”, the Prayer of Jabez helps us use the strength that comes from God to resist evil in our lives and the world around us. 5. “that I may not cause pain….” This concept isn’t discussed nearly enough. As Children of God, we are here to bring JOY to others – not anguish or pain! I’ve said this many times throughout my ministry: “It’s onlyh natural for us to smile! It’s hard work to frown.” To bring joy into the lives of others is our truly calling…..its like wrapping our lives in blessings…gifts we are challenged to give others. 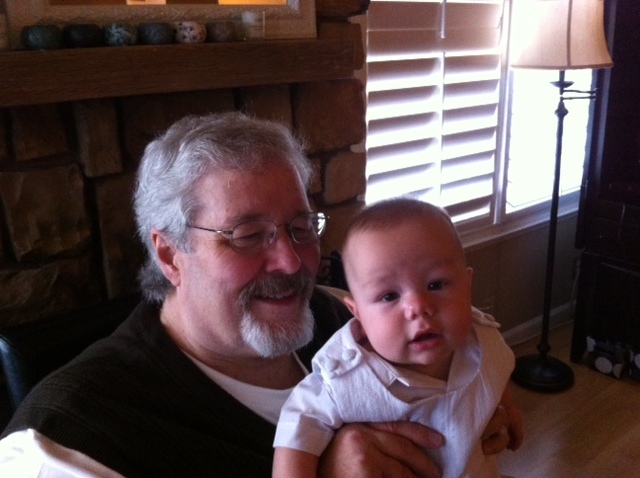 The example of my new grandson, Thomas. He will be two in just four more months. I continue to “melt” with his laughter. Life is so precious. My heart also drops when he has tears in his eyes or cries. It’s only natural to what the smiles in life, the blessings…..who in their right mind would want the tears…..but yes, life has both the smiles and the tears! This phrase takes me back to some memories from High School. I recall various conversations with friends when I was a teenager ready to graduate and make some decisions about where to go to college. “Do I stay close to home or leave the “nest” to travel to Nebraska in order to attend a Presbyterian college.” This was a tough question. This was a risky decision – to leave home to enlarge my personal and spiritual territory. Yet this is what I felt God, at a young age, calling me to do. Active in the Presbyterian church, surrounded by wonderful mentors, I was already starting the adventure in contemplating ordained ministry. I am grateful to this day for the wonderful mentors and prayers from a church that gave me the freedom to “Enlarge My Territory” that would eventually take me to churches in Iowa and Illinois and here in Saginaw, Michigan. My message today: As God has blessed me and challenged me to enlarge my territory of ministry. I know God can do the same for you! What are your hopes and dreams? Where do you feel God is leading? In what ways is God calling you to “enlarge the territory” of possibilities and new adventures God has for you and your future? In what ways has God blessed you? What blessings would you like to pass on to others? Finally, accept the blessing of this prayer. May God continue to expand your boundaries of care and compassion and encouragement offered others. Ending with the theme of this blog: May God continues to bind us together in love….building us up in Christ! Note: Back when I preached this sermon, I made reference to a sermon I read on this Prayer of Jabez by Dr. Stuart D. Broberg, Interim Pastor of the Westminster Presbyterian Church, Pittsburgh, PA, Oct. 3, 2004.